Most progressive cosmetic lines are now on the pink bandwagon - coming out with luscious, pale, but dimensional pinks, taupey pinks or warm pinks, which contain just a hint of yellow in the color mixture. This gives them their flesh tone and salmon warm richness. 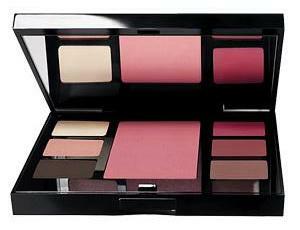 And these new expressive colors are now housed in sleek, slim compacts for busy women on the go. On a final note, you should be able to find your signature shade of pink lipstick at the makeup counter very easily. Just remember two things: If you or the sales person must convince yourselves that the new shade you're wearing is kind of hot- it's not for you. You should love your lips pretty much after the first take. Secondly, make sure the depth of the lipstick is in harmony with the depth of your hair. Obviously blonds will have more fun wearing a lighter pink lipstick, whereas the dark haired diva may introduce some blue or smokey brown undertones in her version of pink. This is to accommodate the depth of her hair color which frames her face. For more makeup tips and advice, or to post your own tips, please visit my Makeup Blog. Welcome the new pink... it's hipper than you think! Robert Closs is the founder and managing director of The School of Professional Makeup in Toronto, Canada. He has been a successful makeup artist for 25 years, and is currently appearing on Life Network’s popular makeover show "So Chic" with Steven Sabados and Chris Hyndman.